How to create a new Quiz in Coassemble. A Quiz is a powerful tool to add to your Coassemble toolset. A Quiz allows you to test your participants' knowledge on a subject, with the ability to grade and assess each participants' scores. 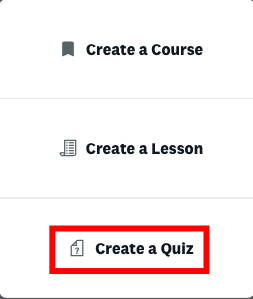 You can include a Quiz within a Course or use it as a standalone module to quickly share with your participants. Step 1: Make your way to the Create tab and left click on the Create tile. 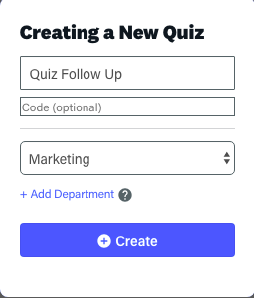 Step 2: Select Create a Quiz from the three options listed, enter a title for the Quiz, choose which department to list it under, and hit 'Create'. Quick Tip: You can create a new department using the blue 'Add Department' button.